How 2 Women Below 50 Years offered prayers in Sabarimala Temple? Sri Ramachandra Murthy January 3, 2019 08:00 IST How 2 Women Below 50 Years offered prayers in Sabarimala Temple? As per report 2 women from Kerala claimed to have entered into famous Sabarimala Temple and reportedly offered prayers with the help of police. Meanwhile this is after Supreme Court's verdict to allow women in restricted ages inside temple and offer prayers. Furthermore even as devotees of Lord Ayyappa severely objected the court's verdict and tried to oppose women's entry, finally two women below 50 managed to enter the Temple and offered the prayers. 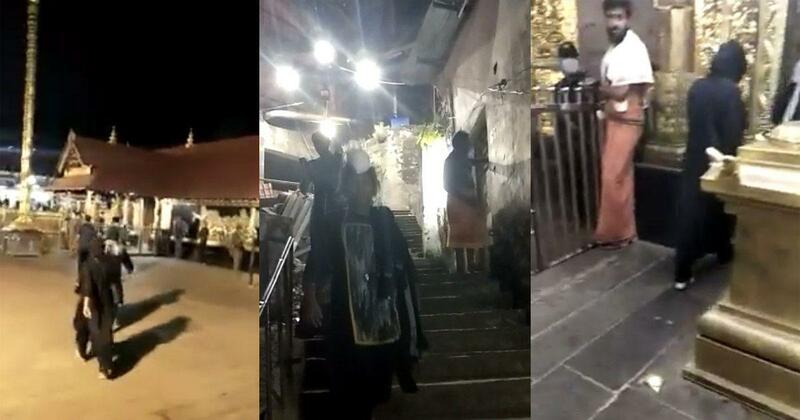 Reportedly after this shocking incident, Temple shrine has shut down its premises for "Purification". Sources added two women Bindu and Kanakadurga had told local media that they had Temple Darshan on Wednesday (2nd Jan, 2019) in the wee hours (around 3.30 AM) and the two women were below 50. Moreover Bindu and Kanakadurga told media that they got all support from police for darshan and it was a smooth and hassle free darshan in the early morning of Wednesday. Apparently the women devotees claimed that none of the devotees who were present have opposed their entry, while local police personnel hasn't confirmed, top police officials have confirmed the Darshan of Bindu and Kanakadurga.